Vintage wedding dresses bridal style. The Anna Vintage wedding dresses are a modern version of a retro vintage bridal look. Bring out your playful side in this dress that features off the shoulder lace straps with a sweetheart neckline. A vintage lace bodice and lace continuing through to the skirt providing eye-catching details. A bow belt at waist helps to create a flattering hourglass shape for your body along with the lace-up back. For the final touches, the Anna Wedding Dress is completed by a tulle skirt to make you feel like it’s the 1950’s all over again. You’ll also have the option to wear this dress as a full length version with a train. The retro style of this dress makes it perfect for a casual wedding with a rockabilly or vintage theme. You can choose this dress to pack with you to wear if you plan to escape and go get married over the weekend! 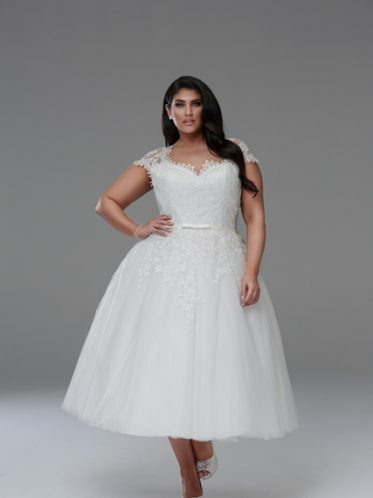 Have some fun and look gorgeous at the same time with this unique wedding gown. Check out the Diana Tea length dress too. 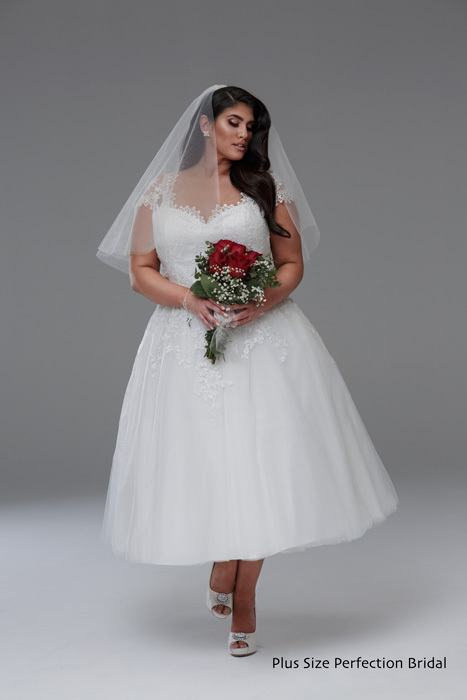 The Plus Size Perfection Bridal label is our featured collection of plus size wedding dresses to help you find the perfect dress for your wedding day. Your wedding dress is one of the most important garments that you’ll ever buy. 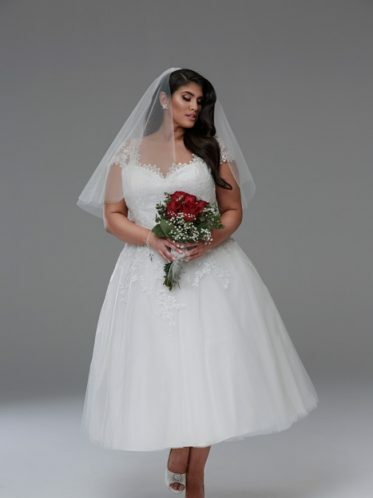 At Leah S Designs, we want you to feel special with a gorgeous wedding gown that is just your style. Now let’s add some accessories! If you’re feeling like a princess, you can pair it with a tiara, a bracelet, and diamante stud earrings. For your hair, it would look great with an updo and shiny hair comb to place your veil.